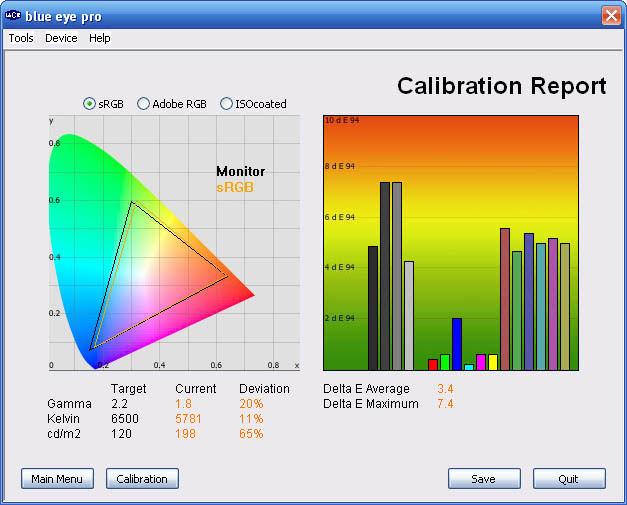 Monitor calibration is an interesting topic, but it can certainly get very complicated and confusing for the the average user. There's a whole host of information out there on the internet if you want to know more about colour management, profiling, colour matching, colour spaces etc. We hope that the following review and article is useful for those wanting to get more from their screen and wanting to understand the topic in some more detail. We have reviewed several monitor calibration devices and several different software packages in the past and we now have X-rites high end i1 Pro (aka Eye-One Pro) device here for testing and review. This review is also hopefully useful for those interested in purchasing one of the various i1 Pro packages. Colorimeters - A tri-stimulus colorimeter measures the colour of a display by using three separate sensors to measure red, green, and blue. Each of the sensors sits behind a filter that isolates a particular colour. 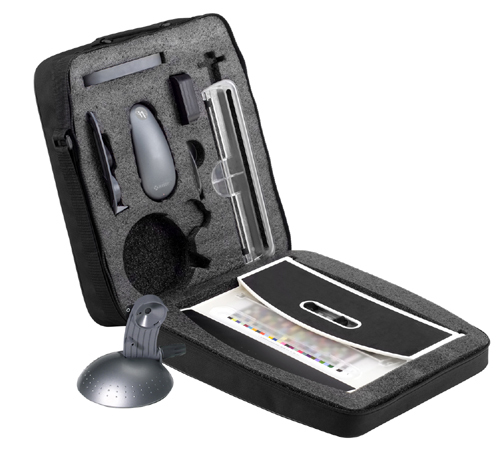 Using a tri-stimulus colorimeter is conceptually equivalent to using a normal white light meter and putting different filters on it for measuring different colours. Most mainstream devices you will hear about are colorimeters. These vary in quality and performance, but just because they are colorimeters does not necessarily make them unreliable. Spectrophotometers (aka spectroradiometers) - on the other hand reads light completely differently. It does not rely on filters as a way of mimicking human colour vision, but rather measures the spectra of a display directly in small bands and uses an industry standard formula to calculate the red, blue and green response. What you see is what you get! Its accuracy depends only on the bandwidth, sensitivity, and resolution of the device. This is why (generally speaking) spectroradiometers don't care what sort of display you're measuring. They are particularly useful if you need to measure and profile many different devices and displays of different types. The i1 Pro is a very highly regarded spectrophotometer device for those wanting something more than a consumer grade colorimeter. The cost of the package is considerably higher than a mainstream colorimeter. This review will look at the hardware device itself, the package it comes in, and will then test several pieces of calibration software including the packaged i1 Match. It should be noted that the i1 Pro range is currently going through a major update and will soon be available with the new "i1 Professional Color Management Solutions". We have spoken to X-rite who confirmed the device itself will remain unchanged, but these packages will feature a new software solution which we will be testing as well in due course. Device powered by USB. No additional charger or battery required. USB 1.1 high power device. Note that one limitation of this spectrophotometer is that the measurement range is not massive. It can only read down to 0.2 cd/m2 with good accuracy which as a modern black point, is not that low. A decent colorimeter device (e.g. X-rite i1 Display 2) would offer a better range, and is rated down to 0.02 cd/m2. At the high end, the maximum reading is 300 cd/m2 whereas the i1 Display 2 is rated up to 3000 cd/m2. For this review, X-rite have kindly sent us the complete "i1 Extreme" package which is very comprehensive. Their website says the following about this package: "i1XTreme is a comprehensive solution that meets all your primary color control needs to implement a complete end-to-end color managed workflow. The industry-standard i1 Pro is the only measuring device necessary for both emissive (monitors) and reflective (print) profiling, giving you complete control over each device in your digital workflow. If you require UV filtration, a UV cut version is also available. 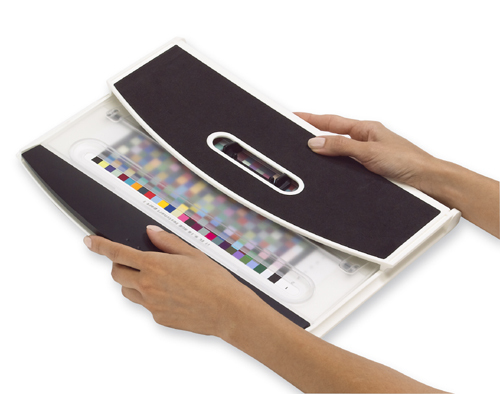 The i1XTreme system is comprehensive enough to be the only color management solution you’ll ever need. 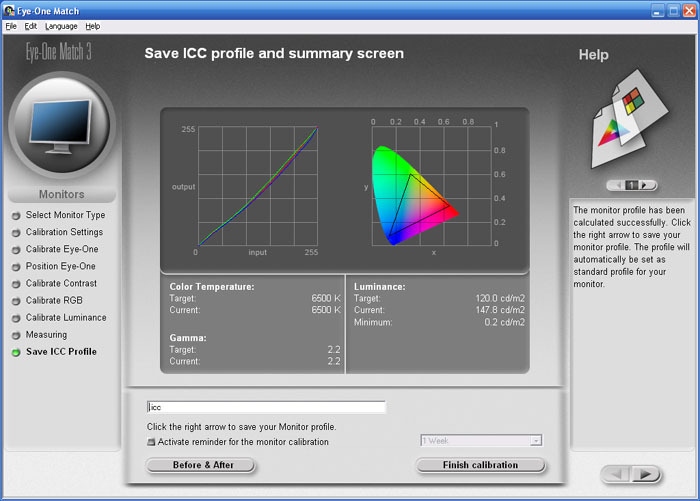 Use it to profile your monitors, scanners, digital cameras (with the optional ColorChecker Digital SG), and RGB and CMYK printers. True colors on each of your LCD, CRT and laptop monitors." i1Extreme is available in either NoFilter and UVcut. Purchase according to your workflow requirements. $400 upgrade voucher valid towards any one ProfileMaker solution. 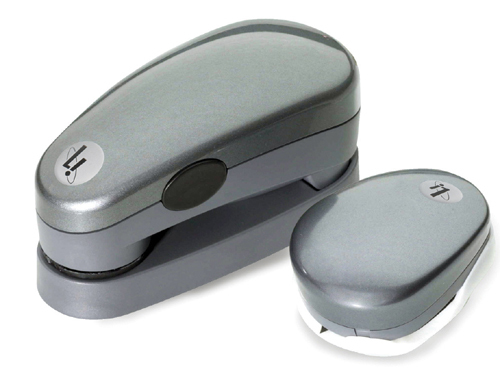 The above images show you the actual i1 Pro spectrophotometer device. The device is pretty big and almost looks like a stretched i1 Display 2 colorimeter in design. It is about 15cm long, 6.5cm wide and 5.5cm high on its own. It feels sturdy and well made. You will notice the actual light sensor on the top right hand picture, in the circular black section. This is the section which will make measurements from your display once connected. As a comparison, here is the i1 Pro next to the i1 Display 2 colorimeter. On the left hand side of the device is the function button, used to calibrate the device itself before any profiling is carried out. The above image shows the calibration plate. This is a small plastic 'dock' which the device sits on. At the right hand end there is a small white coloured reference circle. This is used to calibrate the device before it is used to measure the screens light output. The software will sometimes ask you to place the device on the white plate, and this is what it means. 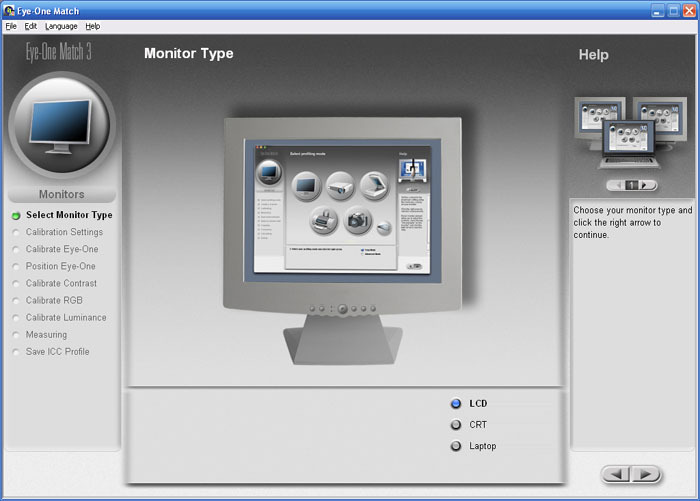 The monitor holder attachment is shown above. It is a plastic bracket with a rubber cable connected at the one end, and at the other end of this is a pretty heavy counter-weight. The i1 Pro clips onto this easily and the weight hangs on the other side of your screen to balance the device. 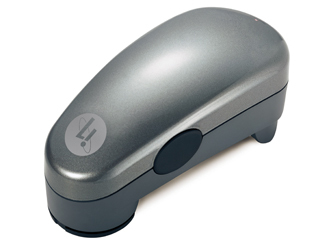 This allows you to position the device easily and steadily on the screen for measurements. The back of the monitor holder has a foam edge so that it does not cause damage to your screen while it is resting against it. The only minor quibble I have is that you have to keep taking the device out of this holder to place on the reference plate before calibration which can be a little annoying. The bottom of the device features the USB connection. The cable is provided in the box and is of a decent length. A 'positioning target' is provided, but is not used for monitor calibration. In a small black plastic box there is an ambient light measuring head as shown above. Above is the 'iBeamer holder' used for digital projector profiling. The device is connected as shown above. The above images show the provided ruler / backup board and colour reference board provided. The i1 Pro is used as shown above as well, but again this is not for monitor calibration. 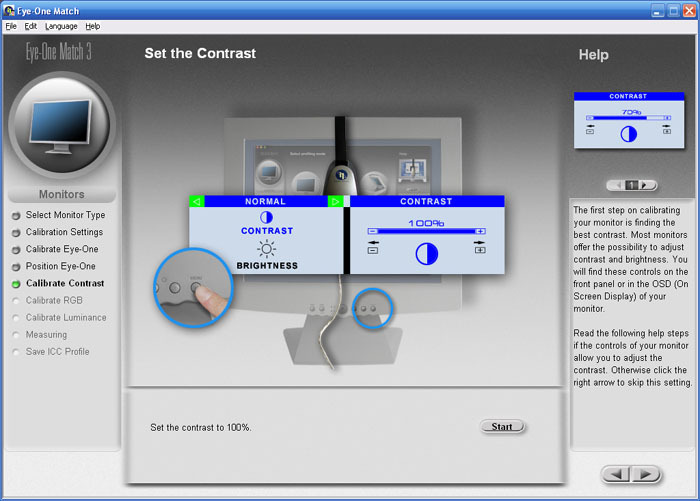 The various bits of software are provided on the above CD (left), and an interactive training package is also supplied (right). A quick start guide is also provided with multiple languages. 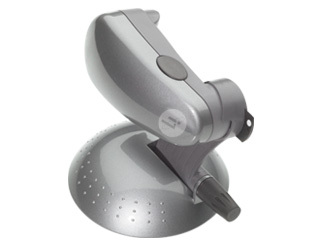 i1 iO - The i1iO is a robotic, automatic chart reading system that is designed to work with i1Pro devices. It’s ideal for photographers, designers, and printers who want to speed up and automate the measurement process. Simply plug in the device, align the test patch, and the scanning table does all the work—no more manual strip reading! i1 Basic - The same hardware device which is packaged here with i1 Match software, ambient light measurement head, monitor holder, soft carry case, spot color positioning target, scanning ruler, backup board, i1 reflective scan target, i1Share software and digital Pantone library. Like the i1 Extreme package it is available in either NoFilter and UVcut. Purchase according to your workflow requirements. 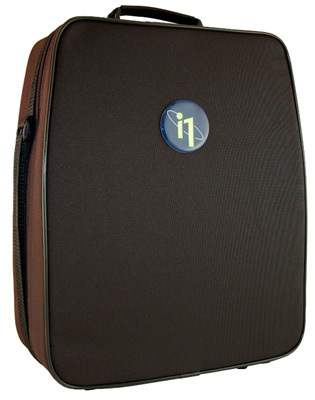 This i1 Basic package is just a trimmed down version of the Xtreme package we have with us at the moment. 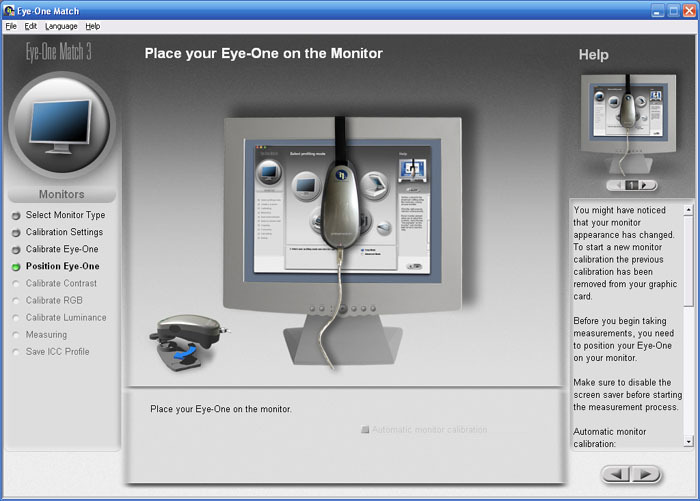 We actually had a look at this nice bit of software when it was paired with X-rite's high end consumer calibration device, the i1 Display 2 colorimeter. At the time, the software was up to v 3.6.1 but the current version is now v 3.6.2 (for Windows, and v3.6.3 for Mac - some compatibility updates for Mac only). I will be updating the i1 Display 2 review soon as well since that is a few years old now. 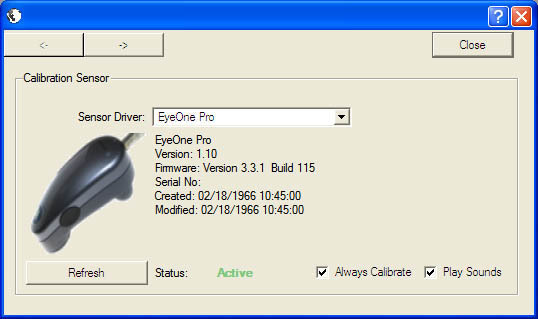 As we stated earlier, there will be a new i1 Pro software package released soon which we will also be testing. Loading up the software presents you with the above screen. There are two calibration methods available, those being 'easy' and 'advanced'. The latter gives you more control and options of course which is what we will use here. There is functionality within the software to check for updates of course, and some limited options available via the top menu bar. If you enter the options section you are presented with the above screen (defaults shown). Matrix profiles are quicker, but a LUT profile can be more accurate and so that is what we will generate during our calibration process here. You can chose which type of display you are using here. We are testing LCD monitors of course. The arrow buttons on the right hand edge control the process, moving you on to the next section once you have choosen the relevant options. Here you can define your target settings for the calibration. We have choosen our normal review targets of 6500k white point / colour temperature, 2.2 gamma and 120 cd/m2 luminance. There is an option here to use the i1 Pro (or other compatible device) to perform an ambient light check of your room if you wish. This will tell you the lighting conditions, light temperature etc of your room if you need to know. Pressing the 'right' arrow takes you into the next screen. Here you are asked to calibrate the device first of all. The i1 Pro requires its own calibration against a reference white point before a monitor calibration or measurement can be taken. Here you are guided to place the i1 Pro on the provided white tile and press either the function button on the left hand edge, or the 'calibrate' button shown on the screen. This only takes a couple of seconds, and afterwards you are told the device is calibrated and ready to go. You're now asked to place the i1 Pro on the screen as shown in the image. You can use the provided monitor holder to hang the device from the screen ready for measurement and profiling. First step is to obtain an optimum contrast control from the monitor. You are guided through a process to reach this using the OSD menu adjustments. A green sliding bar helps you determine the best setting as recommended by the device / software. Next you are able to make RGB adjustments in the OSD menu if you have them available. Again a green sliding scale helps you get the optimum settings for each colour channel, all the while telling you your current and target white point. The process is very easy to follow and doesn't take long to reach the recommended settings. The next step is to reach the desired luminance, again a slider helps you reach your target easily. Pressing the forward arrow then enters you into the automated part of the process. You have made all the adjustments to the hardware (monitor) that you can, and the i1 Pro and i1 Match will now carry out the full monitor profiling. 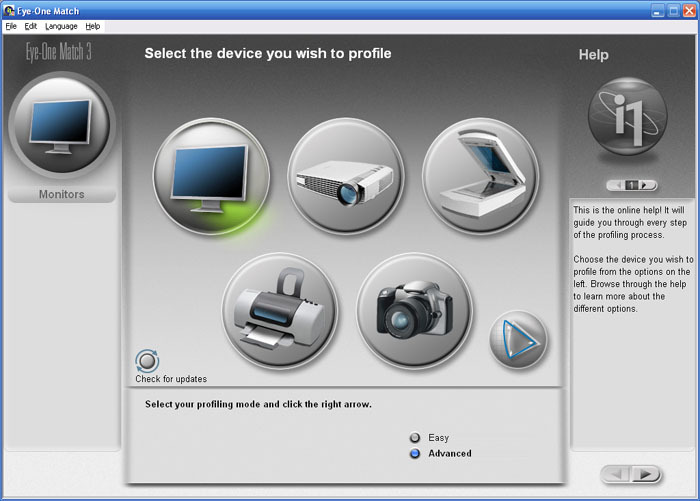 A long series of different colours and shades is presented in front of the device while it hangs from the screen, while a progress indicator tells you it is doing its work. The whole process takes about 3 min 20 sec to complete and an ICC profile is created. At the end you are presented with a summary screen as shown above. Gamma curves are shown along with the readings for white point, luminance and black point. You may notice that the luminance reading is a little above the target value here. This is because the brightness control on the monitor was not adjusted during this particular run-through. The software does not surpess the luminance at a graphics card level which can sometimes lead to banding and loss of shadow detail. 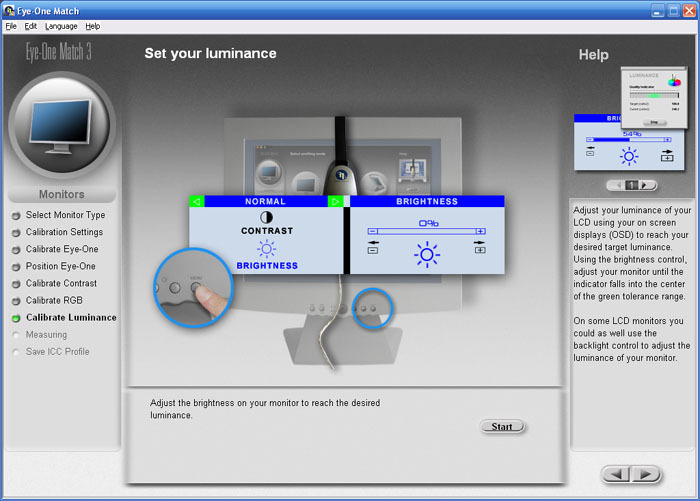 The monitors brightness control should be used to reach the desired luminance as this is (normally) a direct control over the backlight intensity. You are asked to save the ICC profile you have just created and you can set a reminder to repeat this process at a given interval if you wish. That's it in terms of the calibration process. It was all very easy to follow and the on screen guidance is decent and easy to understand. Although it is not massively advanced or detailed, the i1 Match software does provide a simple validation function via the 'help' menu (odd place to put it!) You are first presented with the above screen. Pressing 'start measurement' begins the process. You are asked again to place the i1 Pro on the white tile for device calibration first. After this, a smaller window pops up as shown below. You place the device on the screen and press 'start' to begin a series of measurements. The block presents a series of colours and shades to the device for measurement, allowing it to record the difference between the colour being requested and that being displayed. This will in turn allow the software to work out the dE - the difference between the two. This measurement process takes approximately 1 min 15 sec. You are then presented with the above validation report. You can scroll through the different shades measured on the right hand side, and a dE 2000 figure is listed against each. At the bottom, the software confirms average dE measured as well. This is a useful way to ensure your calibration has been successful and maintain an accurate setup over time. You can use this validate feature at any point with a profile you created through the i1 Match software (but not a profile from any other software package) so you can test how far the screen strays over time. 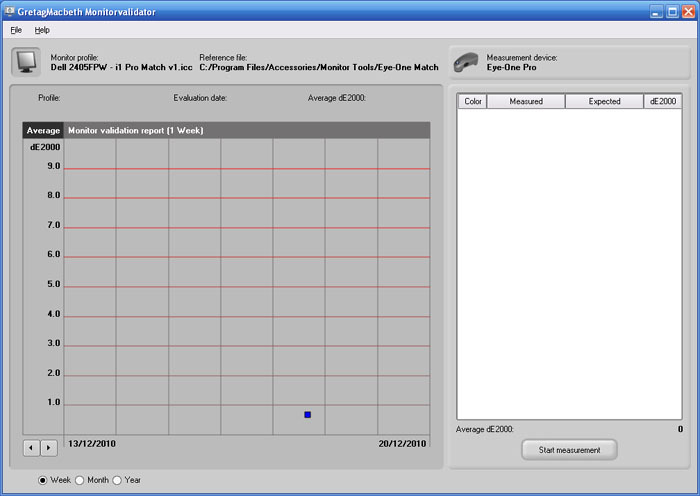 Overall I found the i1 Match software easy to use, intuitive and effective in creating a monitor profile and calibration. 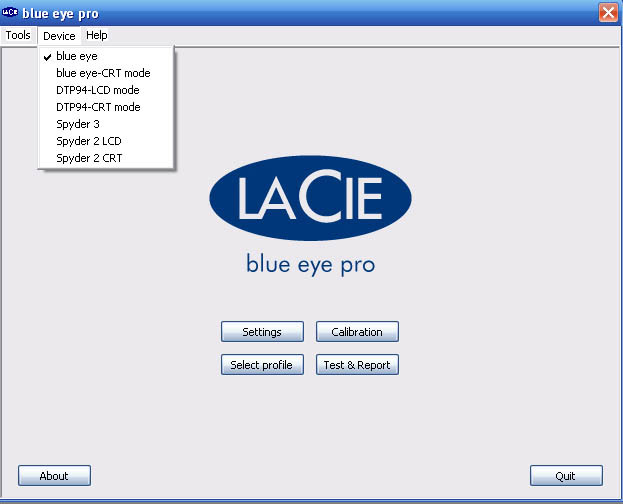 The software is a reasonable option for the standard user but does perhaps lack some of the features, options and reports of other packages such as LaCie's Blue Eye Pro, BasICColor or ColorEyes. For the purposes of monitor reviewing we tend to us the LaCie package since it's 'test and report' feature is very useful, easy to follow and produces some pleasing graphical reports. It is also very good for measuring a "before" view of the screen, able to examine the gamma, colour temperature, luminance, gamut and colour accuracy of the screen no matter how it is set up (or not set up at all in fact). 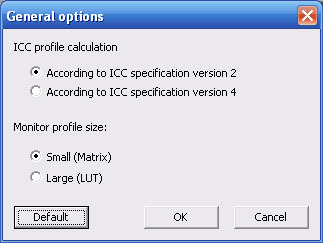 the i1 Match software's validation function is far less detailed and can only be used to validate any given created profile. It cannot be used to test a screen out-of-the-box for instance without a profile active as we like to do for our reviews. Being a very versatile spectrophotometer, the i1 Pro can be combined with many other software packages in the market. We will briefly test these as well, although will not be going into the levels of detail we have with the X-rite bundled i1 Match software. 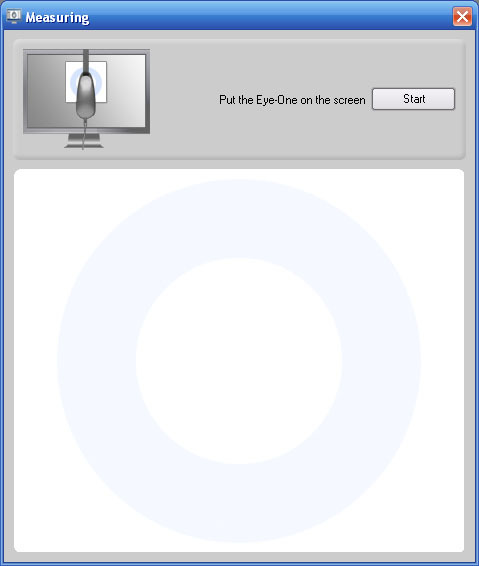 Although it's not listed specifically in the 'devices' menu, the i1 Pro is compatible with the Blue Eye software. If you leave the device selected as 'Blue Eye' then it works fine. Before any calibration it asks you to place the device on the white reference tile to calibrate the device. After this, the software works as it would with the i1 Display 2 device we usually use in our reviews. As I've mentioned already, the LaCie software has a very useful test and report function. This can be used to examine the set up of any screen at whatever point, and in whatever setting. This is useful when reviewing monitors as it allows us to test the screens factory setup, before any calibration or profiling is carried out. We hooked up the i1 Pro device again and loaded up LaCie's software (v 4.5.5 is the latest). I restored the monitor to factory settings and disabled any active graphics card adjustments / ICC profiles. I first of all tested the screen we were using (Dell's 24" 2405FPW S-PVA monitor) to establish the 'before' picture. This test and report takes approximately 20 seconds to complete. As you can see, the default settings of the screen were considerably off from the desired targets. There was significant deviance in gamma set up (1.8), and luminance was very high at 198 cd/m2. 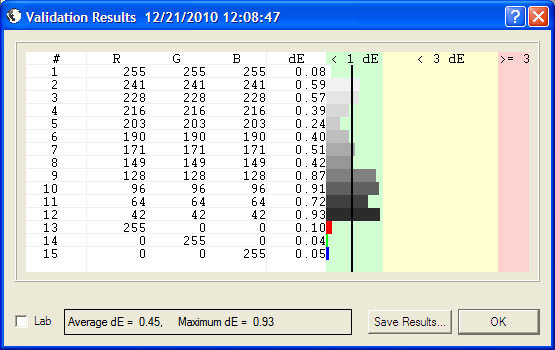 Colour accuracy was not very good either with dE average of 3.4 and maximum of 7.4. This is a typical default factory setting of many monitors and so proper calibration would be needed to correct this and improve the picture quality. Thankfully we have a high end spectrophotometer here to do just that. I then entered the calibration mode. 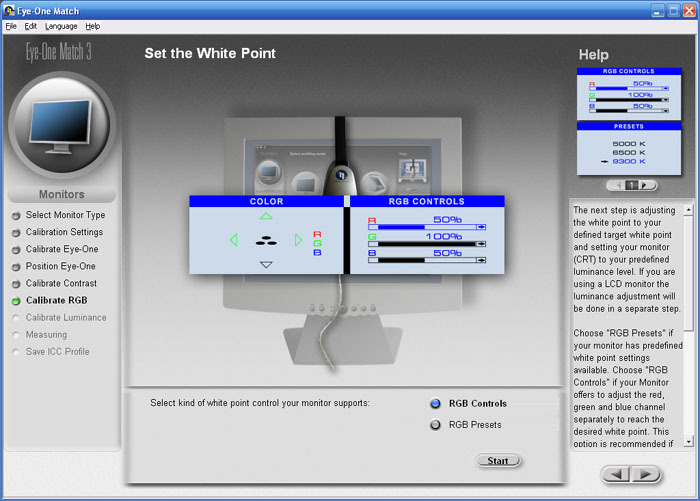 Like X-rite's i1 Match software you are guided through adjustments of the OSD menu for brightness, contrast and RGB levels. After this, the software carries out a fully automated process making adjustments at the graphics card LUT level and creating an ICC profile. This whole process takes approximately 3 min 35 sec to complete during which a series of colours are flashed in front of the device. After this is completed you are prompted to save your profile. I then carried out another test and report to capture the 'after' results. As you can see, the software did a great job of profiling the monitor and correcting the settings in line with our targets. Gamma, colour temperature and luminance were now all pretty much spot on. dE average was down to a much lower 0.6, maximum of 1.9. Again the i1 Pro device is perfectly useable with this software if you wish, producing some excellent results and an easy to follow process. We have used this combination in our recent BenQ XL2410T review as well in fact. 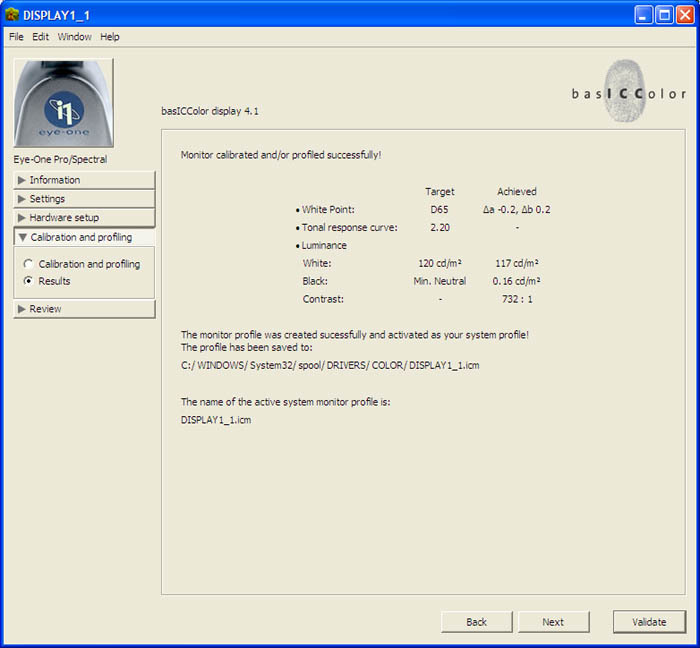 BasICColor is a rather nice piece of software which has a lot of options and features and is well regarded in the market. A free 14-day trial license for a fully functional version is even available from their website. This is very similar to the NEC SpectraView Profiler software we tested with the NEC PA271W monitor, as they manufacturer the software for NEC in Europe. The current BasICColor software is at version 4.1.22 and we will test it briefly here with the i1 Pro device. 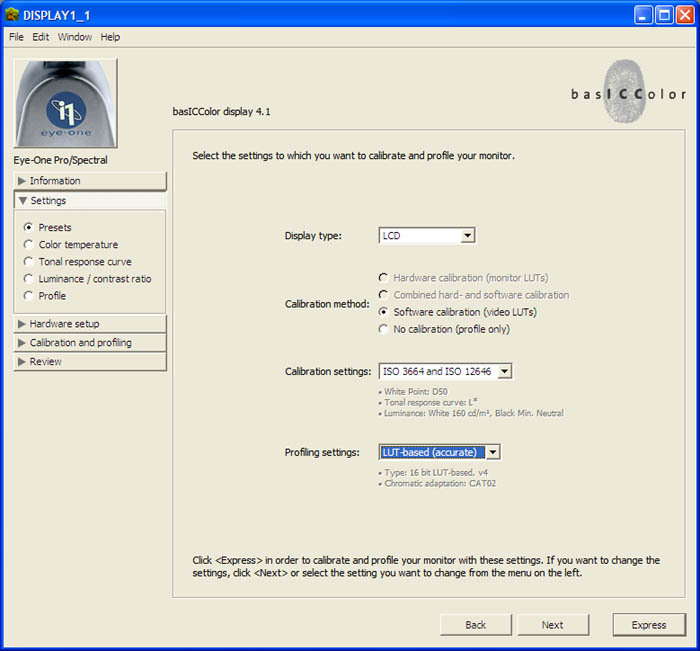 A settings screen allows you to configure your calibration targets. 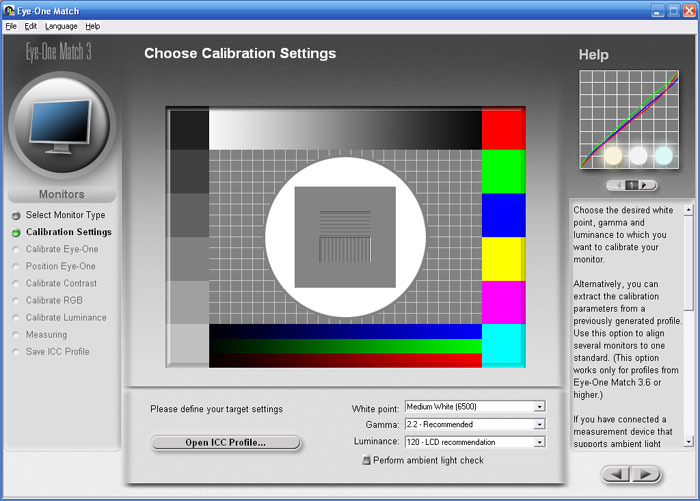 You will also notice the 'calibration method' section allows you to choose between hardware and software calibration, depending on whether your monitor supports hardware level LUT adjustments or not. We set all our usual target settings in these sections in the first instance. You can select the i1 Pro as a compatible device with this software. You are asked to calibrate the device by placing it on a 'dark opaque surface' as opposed to using the white tile. Once you've done this you can progress into the calibration process. The actual calibration process switches between many different colours and shades and is all automated. It takes around 2 min 45 sec to complete. After calibration and profiling has been done you are presented with a summary results screen. You can validate the profile even further by pressing the 'validate' button shown. The validation takes about 32 seconds to complete using the i1 Pro. 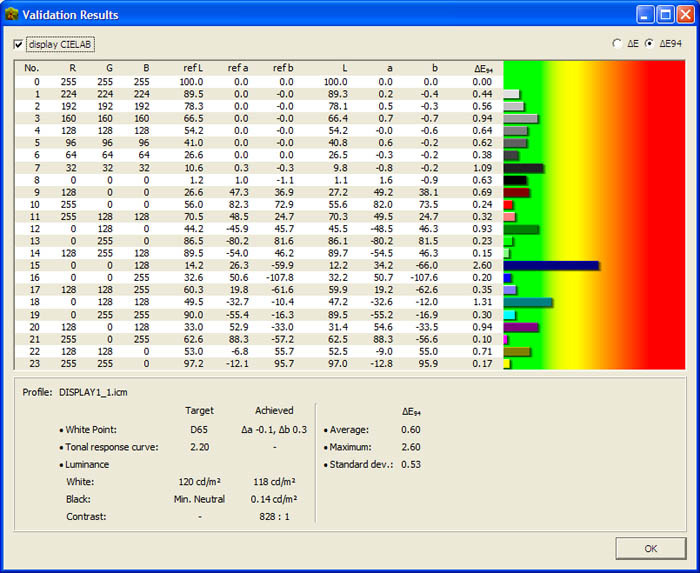 The validation in BasICColor's software is pretty thorough and useful, and quite similar to that prestented by LaCie's Blue Eye Pro software. Confirmation about luminance, black point, contrast ratio, and colour accuracy is given. Again these reports are very useful. Like LaCie's software you are able to validate the monitor set up at any point, not just after a valid calibration. This is again useful if you want to run a before and after view of your screen. Within the settings you can specify your calibration device, and we selected the i1 Pro here. 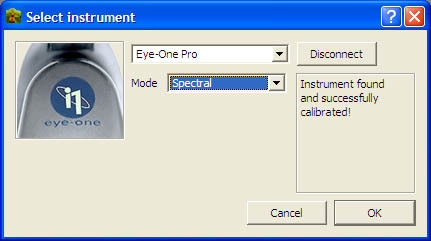 You can again set all your targets for calibration in the normal way and this is straightforward and easy to use. Once you have done this you are prompted to begin the calibration process. With 76 steps of measurement (for highest accuracy) this takes quite a long time to complete and lasts about 5 mins 10 seconds. 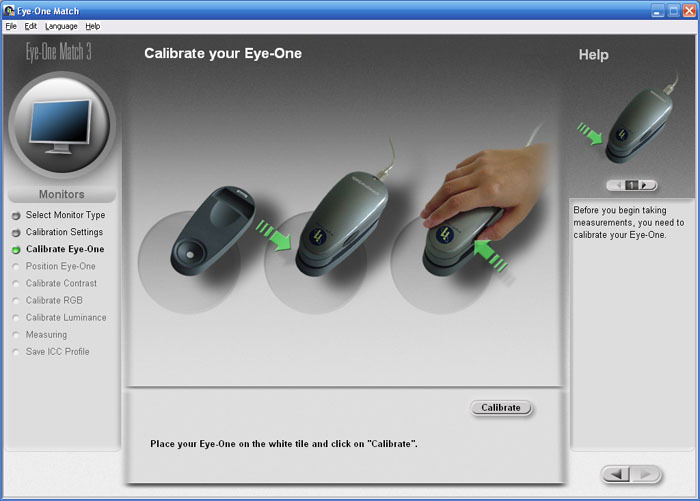 You are asked to calibrate the device as shown above by placing it on a black surface, again instead of the provided white plate method used in the i1 Match software. After the calibration has completed the software automatically enters into the validation process (assuming you didn't disable it). This validation takes around 45 seconds to complete and confirms your colour accuracy after calibration. A dE average and maximum is provided along with a simple bar graph of deviances. Again this is a useful feature for validating the performance of the screen and active profile. The i1 Pro hardware itself is widely regarded as a high end spectrophotometer and is one of the best you can buy without spending several thousands of pounds or getting true 'reference grade' equipment. Being a spectrophotometer it offers the most accurate readings for the widest range of displays and is more suited than a colorimeter due to the way it reads light and makes measurements. The i1 Pro does have a drawback in its relatively limited low-light sensitivity. It simply does not read as low (close to black) as most colorimeters. The i1 Pro alone is therefore not the perfect choice for gamma and contrast measurements that will generally require readings below the i1 Pro's effective operating range, but it can easily be paired with a decent colorimeter to provide these measurements. In addition to its superb accuracy it is the most versatile meter available due to the technology used. It is able to read just about any kind of display accurately including CRT, plasma, LCD, standard gamut, wide gamut and LED backlit displays. Spectrophotometer technology is typically slow however: It can take longer for each read to come back and update the software that you happen to be using, especially at the dark end of the grey scale. 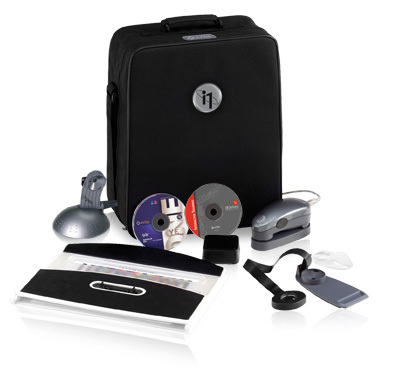 I felt the i1 Extreme Package was very professionally presented and came with many different parts and extras for use with photos, printers, projectors etc. We have tested the device with monitors here of course and we found the results very pleasing. 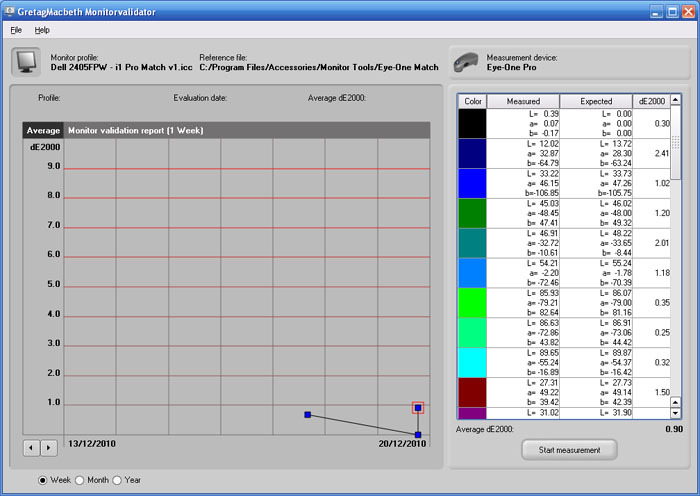 The i1 Match software is simple and easy to use and produces some excellent results. Although it doesn't have the greatest reporting feature, it at least gives you some validation process. The i1 Pro itself can be easily paired with other well regarded and popular software packages as well so there is a lot of flexibility. We are looking forward to testing X-rite's new software solutions when they are available too. The i1 Extreme package retails for around £1,100 GBP so it's not cheap of course. The new i1 Pro packages have yet to be defined so there might be a more cost effective way of getting the device if you don't need all the additional extras or only need it for a couple of uses. A high end colorimeter like the i1 Display 2 for example retails for ~£140 and is probably suitable for most regular monitor users. Those who need high end performance and calibration, want professional grade results, or need to carry out colour management between various devices and technologies could well benefit from a high quality spectrophotometer like the i1 Pro.